I found that adding the whole wheat gave the cookie more body and decreased some of the sweetness. This made my husband happy since many American desserts are much too sweet for him. 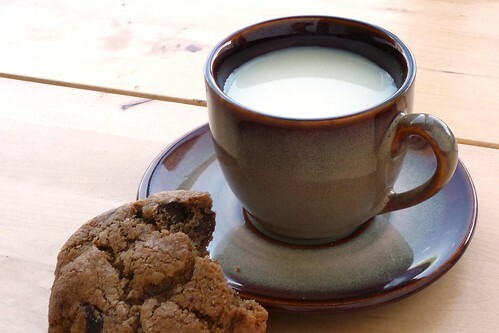 I liked the thick, chewy texture and the subtler flavor — this is the perfect cookie for dunking in cold milk. Melt butter and add to the work bowl of your mixer. Add sugar and brown sugar, cream together1 on medium speed. Add egg, egg yolk, milk and vanilla, mixing until thoroughly combined. Slowly add flour, salt and baking soda2 at a low speed and continue to mix until everything is thoroughly combined. Scrape down sides as needed. Stir in chocolate chips (or dump them in while on the lowest speed). Chill dough for an hour or two, then preheat oven to 375F. 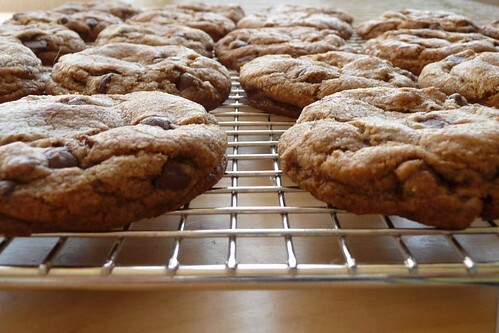 Portion out 1 ounce cookie balls onto a parchment-lined baking sheet, placing cookies about 2″ apart. Bake for 12 – 14 minutes until the edges turn golden brown. Remove to a rack to cool completely before storing in an air-tight container. “Cream together” means to beat the sugars and butter at moderate speed until the mixture is fluffy. I know all the cookie recipes lately call for sifting together the dry ingredients. I still don’t do it, instead adding dry ingredients periodically and relying on my mixer to do the heavy lifting. While sifting is fast and easy in a food processor, I still have to wash an extra appliance, and if not, an extra sieve — too much for this cook. This entry was posted in cookies, recipes, untranslated. Bookmark the permalink.